complete three races. Updated results will appear as soon as possible after the race. Your race number will be written on your upper arms & legs, you will also be issued with numbered stickers to be placed on cycle helmet, cycle and paddle with a further waterproof number for your kayak (please place this on the left front of your kayak). A secure transition will be in place at Ancholme Leisure Centre to allow you to rack early (from 0630hrs) and then make your way down to the canal opposite the Leisure Centre with your kayak, please bear in mind parking is restricted and you may wish to take your kayak down early (a marshal will be available to keep the site secure). Team transitions are in the transition area, simply exchange the wrist band but be aware of other competitors around you, please do not get in the way of other competitors while you wait. All competitors will start at 8:30am. Results will be available on the day and also will be posted on our website. As an entrant to this event your information may be shared on the event or club website, social media pages or in emails sent by or on behalf of the club. This data will only be shared in relation to your participation in the event, e.g. the list of entrants, results or event reports. This data will be limited to your name, town, nationality, gender, age, age category, the name of the affiliated club or team of which you are a member and your finishing time and/or position. 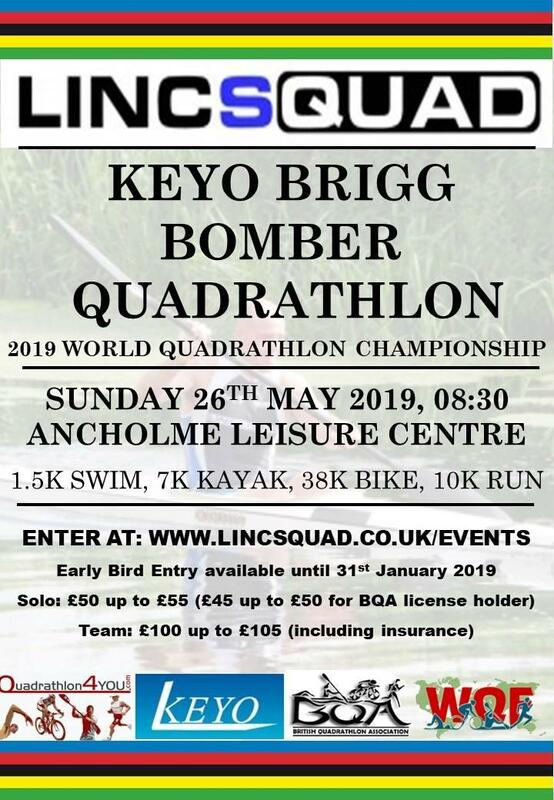 The Lincsquad committee has worked extremely hard to ensure that the race is a success; please do all you can to assist us on the day. Looking forward to seeing you on the day, have a safe and great race.